These belts are great! They are standard belts, but the sizing for us is always right, and they do not wear out as quick as other belts I've seen. Fantastic gear for all my students! These double wrapped belts are second to none for their quality, and their ability of retaining knots as we grapple, kick, sweat, and train! Highly recommended for anyone looking to deliver top notch gear for top notch training!! I have been using these belts for over 20 years and they are great. The colored belts usually have a sharp edge from the cutting and melting but that can be fixed with a lighter. They fit great and last forever. The color even holds over time and many washes. These are great solid double wrap belts. They hold up well, tie well and feel good. They are not to flimsy like other belts I've used. 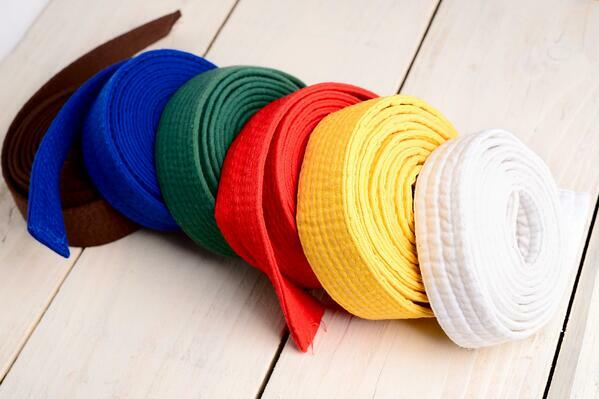 Find all the belts you need, from beginner youth belts to master-level belts, at Century.